1. My husband is in the army, so i like to keep everything as modular and portable as possible, 2. I am currently prepping for a move, so I am currently in down-size mode, and 3. I love using my computer. Okay, now for my questions: David talks a lot about the proper supplies and having a general reference file. I’m kind of resistant to the idea of investing in paper file folders and filing cabinets when there is so much technology and digital recording available that doesn’t take up near the amount of space. What have you found to be the best capture system for your files? Digital or old school? I would like to start by saying that you’re right in pointing out that I have enormous respect for David Allen. He is able to communicate his ideas about information organizing and productivity better than anyone else writing on these subjects today. This art of communication is a true talent and it is rare. Most importantly it is extremely helpful for those of us looking for guidance and sanity as we work and live. If anyone reading this hasn’t read his books, I strongly recommend them. That being said (i.e. I’ll stop being an exhuberent fangirl for a moment), I don’t use the GTD system exactly as he prescribes. It’s not that I think his system is flawed or bad or wrong; it just doesn’t completely work for me and my preferences. And, at least in my personal experience, I’ve found that this is the case for most GTD enthusiasts. We gobble up all we can from his advice and then put our spin on it so it will be something we benefit from and use over the longterm. If you’re like me, a good amount of the information you collect likely comes to you already in digital form or can easily be scanned and/or digitized (images, emails, PDFs, calendar appointments, etc.). To take these out of a digital form during the processing and organizing phases would be a waste of time and resources, and Allen doesn’t advocate you print these out, either. The most important thing to do is to capture this information in a way so you can reliably process, review, and do all the things you need to do to get things done. I use a couple plugins for my Mac-based email program Mail that are created by the company InDev: Act-On (which let lets you apply rules to incoming messages) and MailTags (which color codes emails with tags). These are nice for adapting GTD processing and organizing actions, as well as helping to creation action items. Even if you didn’t use the GTD system, these are great plug-ins for email management. I incorporate these plugins to work with my personal email filing system, which I’ve outlined in detail in Unclutter Your Life in One Week. In short, I use Archive, Project Folders, and Read Me folders. The Archive folder is where all messages go after I schedule the work on my calendar or in my project management system. The Project Folders are where I stash project-related information until I can move the email to the Archive folder (e.g. where I put Ask Unclutterer emails until I review them and decide which one I will select for the week’s column). And the Read Me folder is for long emails or emails containing links to articles, typically sent from friends or family, that don’t require immediate attention and that I can read in full the next time I’m standing in a line or waiting on hold. Once I read the Read Me emails, they are moved to the Archive folder. As far as my personal to-do list (action items) and calendar, I do keep these in paper form. I like the physical actions of writing and greatly enjoy crossing things off lists. For the past six months, I’ve been using an Arc customizable notebook from Staples for the list and calendar. I’ve tried to do it all digitally, but I always seem to come back to the paper items for these two things. Comfort is a powerful creature. For work, I keep everything in Basecamp so everyone on staff and our clients can see important dates, to-do items, as well as communicate with each other. It’s ridiculously simple to use, which oddly is why some people don’t like to use it. There are hundreds of digital to-do list and calendar programs on the market and a few are probably already installed on your computer — just find one you love and will use and review. In regards to other digital paperwork (the general reference stuff), I have set up my Evernote account to mirror the GTD workflow. Everything digital is dumped into it and it syncs with all my handheld devices and can be accessed anywhere in the world there is an internet connection. I also back it up to my desktop and back my laptop up to an external hard drive and again to Backblaze (I’m a wee bit maniacal about backing up my data). I save all my documents locally in a document management program (DevonThink), which I’ve discussed recently in “What tools should I use to digitize my paper piles.” If Evernote and DevonThink aren’t your style, check out OmniFocus for Mac and I know many of our readers use OneNote who have the MicroSoft Office Suite (be sure to check out the free, downloadable templates from MicroSoft to save yourself time). Thank you, Rachel, for submitting your question for our Ask Unclutterer column. I hope I was able to help you in your pursuit to get things done and adopting Allen’s GTD system for your digital needs. Also be sure to check the comments for even more advice from our readers. I know we have numerous GTD enthusiasts who read the site and are active in our comments section. Summer has kicked into high gear here in the northern hemisphere and this is when I like to retreat from the heat with a proverbial good book — but certainly not a “book” as my great-grandparents would have described one. Today, there are apps and devices that let you curate your summer reading from varied online resources and onto hand-held devices. With a little bit of time, an Internet connection and some free software, you can create your own digital reading experience and bring it to the beach, the hotel or even your favorite quiet corner of home. Below, I’ve described several services that allow you to save or bookmark online articles for later reading. Once captured with the various apps, the articles are presented beautifully and legibly, as if you’re reading a digital book or magazine. Advertisements are stripped out, as are distracting sidebar ads and colors. You’re left with a great-looking and largely distraction-free reading experience. Best of all, these services are free and work on a variety of platforms, from iPads to Android devices to Nooks and Kindles. When you’re out with your mobile device, launch Pocket and you’ll find all of the articles you’ve saved. Some of Pocket’s useful features let you browse articles by tag, add a star to favorites and view videos and images you’ve saved in addition to articles. Readability works much like Pocket. Create a free account, install the bookmarklet in your browser and send articles to your mobile device. There are important differences, though. For starters, Readability’s bookmarklet is much more robust. You can opt to read an article right then if you like, and Readability with present it in a beautiful, distraction-free layout. You can also send it to your Kindle or Nook Tablet with a click. Once you’ve synced your devices, you can access your reading list when offline. Instapaper is among the first of these distraction-free reading services. Today it’s available on a huge number of devices and supported by a passionate developer and legions of fans. The iPhone and iPad version has some unique features, like tilt scrolling. This lets you scroll through a long article simply by tipping your device back and forth. There’s no need to swipe with a finger. You’ll also find lots of layout customization options, like font size, several color schemes, spacing and brightness. After a minute or so of fiddling, you can get Instapaper’s articles to look just how you’d like. Flipboard is unique in that you don’t add content to it. Instead, you tell Flipboard what to find for you. It will search the web for stories, photos and videos across several categories, including sports, technology, travel, photography, news, music, film and so much more. It will even pull content (articles your friends have linked to) from your Twitter and Facebook accounts, presenting all of it in a beautiful layout that’s reminiscent of a high-end design magazine. You can even add local news and your favorite RSS feeds. It’s such a great-looking app and has become my favorite way to browse Facebook. There you have four services that will let you curate your summer reading, across several devices. Now start collecting, get reading, and enjoy these lovely, lazy days. This week’s unitasker and suggestion for an alternative were sent in to us by reader Tammy, and my initial thoughts were: “but Tammy, you could use the bowl for something else, like pasta!” Which, let’s be honest, you probably could use the bowl for something other than watermelon if you were willing to take the risk of getting stabbed by its pointy edge. However, since the bowl is painted like a watermelon and is called a Watermelon Serving Bowl, my guess is that most people buying this bowl are only getting it out of the cupboard a few times a year (or decade) just to serve watermelon in it. This hand-painted earthenware bowl works on the same principle as a real watermelon bowl except it doesn’t ever expire. Thanks, Tammy, for sending in this item and reminding me that solving problems that aren’t really problems often can lead to unnecessary clutter. Moms, be more like dads. Don’t multitask. Dads just do one thing at a time and are more productive. Naturally, I started comparing myself to my husband, and thought about how we both started our morning that day. Got up before husband and baby. Changed the baby’s diaper. Prepared bottle for the baby. Put client materials in the car. Put laundry in the washer. Washed coffee mugs. Showered. Started getting dressed. Removed clothing from the dryer (put in from the evening before). Folded clothing. Put wet clothes in the dryer. Filled dog bowls with food and water. Finished getting dressed. Did make up and hair. Wrote a note for the babysitter. Left for a client visit. As you can see, we both had vastly different mornings. Did you also notice that I did a bit of multi-tasking? Against my better judgment, I moved from one task to another, at times, not finishing one thing before starting the next (e.g., doing laundry before I finished dressing). I’ve read the studies about the negative effects of task switching. I know that trying to attend to more than one thing at a time makes you less efficient, and that people who multitask tend to underperform. It also can cause negative stress, which I certainly felt. Why did I do this even though I knew better? The short answer is because I had lots to do. Truth be told, I added more tasks to my usual routine even though my schedule that day was not typical. I tried to get many things done so that I wouldn’t have to take care of them later in the evening. Still, there were other options available to me. Looking back on that day, I would have done things differently. Create a reasonable plan for the next day and stick to it. I normally take a look at my schedule each evening to see what the next day will be like and make adjustments as needed. My forecast didn’t include anything extra because I had a limited amount of time to get things done, and I should have kept it that way. The laundry could easily have been done at another time. When there will be a change to your regular routine, decide on a realistic plan and schedule non-priorities for another day. Pause and assess what is important. I decided to do laundry that morning. This chore wasn’t a part of my master plan or essential to my day. Did it need to get done? Yes, but not then. We can often be reactive instead of being proactive when we feel pressured. As a result, we can end up moving too quickly without fully thinking things through. Taking a moment to slow down, to figure out what things need to be done will help stop you from randomly starting new tasks. At times like this, your schedule and/or to-do list will come in handy. Focus on one thing at a time. Had I given my attention to one thing and completed it before moving on to the next, I would have realized that I just didn’t have enough time to include any unplanned activities. Multi-tasking can negatively affect your ability to make purposeful decisions and you will expend more time switching from task to task. You can find yourself in the midst of doing many things at once and begin to feel overwhelmed. Instead, try your hand at single-tasking. Focus fully on one thing before proceeding to the next, and you will feel more calm and prepared to manage your remaining tasks, and ultimately, be more productive. Ask for help. This is often a simple fix and one that is frequently overlooked. I could have asked my husband to take care of the laundry before he left for work. It’s possible that I was too caught up in what I was doing to even remember that I had that option. Getting help from a friend, coworker, or family member can certainly make a chaotic day less stressful. If specific days are more hectic than others, you can arrange to have help on those days or partner with other available parents/colleagues/professionals, if possible. Interestingly, though I was focusing on more than one thing, I seemed to get several things done. However, I can’t argue with the fact that I felt agitated, a side effect of multitasking. Was I was less productive than my husband on that morning? I could probably come up with a good argument that I wasn’t based on the number of things I did. However, in hindsight, I don’t think it was worth it in the end. The laundry was no worse for the wear, but my morning could have had a much better start. I didn’t need all that stress in my morning. The next time you’re tempted to tackle many things at once, stop and breathe. Re-focus, check your list, and pick one item to start working on at a time. It may take a little getting used to, but in the long run, you’ll be pleased with how much you can accomplish and feel less frazzled at the end of the day. When I was in grade school, I would often daydream. I’d stare out the classroom window and imagine myself running through the sprinklers or going to the beach. Sometimes, my teacher would tap me on the shoulder or call my name (loudly) to get my attention. When I became part of the workforce, I didn’t daydream as much, but there were certainly times when I found it difficult to stay focused while at work. Now that I primarily work from home, I’ve discovered that while I can be very productive and get things done, my energies can sometimes be directed at the things I shouldn’t be doing. Unwashed laundry can be distracting to me. Dirty dishes in the sink and a carpet that needs vacuuming also can cause my mind to wander. It may be hard to imagine I’d rather clean than do work-work, but chores are things I actually enjoy doing. As much as possible, take care of distractions before working. Since I have the need to clean, I make sure I do it each night before bed. The dishes are washed, the pillows on the sofa are fluffed, all the chairs are pushed under the dining table, everything is put back where it belongs, and the counters are cleared before I go to bed so I won’t think about them the next day while working. If you are distracted by disorder or something that can be completed ahead of time, take care of these items each night before heading to bed. Work at your best time. I’m a rock star in the morning hours. I often say that I can solve the world’s problems at 6 a.m. While this is an exaggeration, I know that I’m most productive in the early hours of the day. Knowing when you are most productive and clear-headed can go a long way in helping you to focus on your work. For a couple weeks, track what you do over the course of the day and when you get the most stuff done. Then, structure your schedule so you can do the work that requires the greatest amount of focus during the times when you are at your best. Work at a table or desk. To ensure that I continue working productively over the course of the work day, I need to sit at an organized desk (or table) and in a sturdy chair. My brain equates these two things with work. If I sit on the sofa, I can still get things done, but it’s too comfortalbe and too close to the television (which can be a bright, shiny, HUGE distraction). Work in a place that feels like you should be doing work there. Keep your to-do list visible. My to-do list is my map for the day. It tells me what to do and when to do it. And, each time I cross something off my list, I’m motivated to keep working. If I don’t have my list in front of me, it would be very easy to start working on something that’s not a priority. It’s a good idea to start each day by reviewing your to-do list or creating one so you start your day with a clear understanding of where you’re going. Add deadlines to your task list. I’m deadline driven. Without deadlines, I meander in my thoughts and actions. I get a thrill from turning in a project on time and this feeling intensifies when I deliver ahead of schedule. When I begin working on a task or project, I keep due dates at the top of mind by writing them on my to do list. You can also use a calendar, a stop watch, or any other device that will help you to reach goals by specific times. Keep email notifications turned off. My emails are filtered through Outlook and for a very long time, I used to keep the audible and visual notifications active. This became too distracting as I would often stop to read my messages whenever the little red “new mail” indicator would appear. Since email comes in at random times, it was virtually impossible to work during any time block without interruptions. Now, I check e-mail when on a schedule or whenever I take a break. I know not every job allows for this, but if yours does, turn that notification off when you need to focus. Have water and healthful snacks close by. The downside of being productive for me is that I forget to eat. To avoid this, I keep a bottle of water and select a few brain-fueling snacks at the start of the workday to nosh on instead of going hungry. Other folks who work from home often find that having an entire pantry of food nearby results in them constantly snacking on whatever is in the house. If this sounds like you, selecting your snacks at the start of the day will keep you from taking excessive breaks to the kitchen. Take breaks and stretch. When I come back from a quick break, I find that I’m able to think more clearly and sustain my productivity. I pause several times throughout the day, and I also stretch or do a few yoga poses (like standing forward bend). This helps me re-set my mind and body and gets me ready to sit through another working time block. At least once an hour you should move a little to keep you at your best. Working at home has many rewards but is not without challenges. By thinking through (and testing) the steps that complement your personality and work style, you can create a system that lets you face your challenges, push distractions aside, and maintain focus on important tasks. Those of you who telecommute full time, part time, or even occasionally, what would you add to this list? Share your suggestions in the comments. You may remember we featured AlmostBunnies’ tiny desk office back in 2010. Since then, she has grown the space to meet her new needs, and we love the changes. The paper file boxes nicely hold her paper filing — bank, health, auto, utilities, taxes, pets. A filing cabinet isn’t for everyone, and it’s nice to see an example of a simple-to-use and functional alternative. The plastic containers on the small shelves contain beads for crafts. The pen cups, which she had on her previous desk, are still working wonderfully to hold her writing utensils on her new desk. She explains that she has two metal drawers that sit below the work surface that hold more craft supplies — an important task when one has pets in the house. I also adore the pulled string held up with two push pins that serves as a simple clipboard for inspiring cards and small pieces of artwork. In this room, everything has a place and (when not being used) everything is stored in its place. A truly wonderful home office, AlmostBunnies, and thank you for sharing it with us. Yesterday (June 20th) was the first day of summer for those of us in the northern hemisphere. I, for one, am very happy about the start of summer. The days are longer and there are so many fun things to do, like taking road trips and long weekends at the beach. I’m really looking forward to sharing new experiences with my husband and 5-month-old. Planning ahead will be even more important for us since we are now traveling together as a trio. Once the vacation dates are selected, figure out where you’ll go. Will you be taking your annual trip to your favorite destination or will you go some place new? Are white, sandy beaches on your mind? Or, would you prefer something more active (like a hiking vacation)? Once everyone agrees on the location, do a little research to find out if there are any special events that you’d like to attend, and add them to your calendar. Who will be responsible for making the flight and hotel reservations? Or, will everyone handle their own arrangements? If you’re taking a road trip, figure out if you’ll drive to your destination together or if everyone will drive their own car. If you’re carpooling, do you need to rent a larger vehicle and who will handle that? Who will bring the snacks and drinks? The last time I took a road trip, I brought the world with me. Since I would be on the road for eight hours, I wanted to have everything I could possibly need at my fingertips. When you’re driving with a child and dog in the car for more than an hour, you really don’t want any surprises. As it turned out, I didn’t use half of what I packed. But, now I have a better idea of what I will use the most and this will help me when it’s time for our next adventure. No matter where you decide to go this summer, put a few plans in place first. Planning may not seem like fun, but thinking things through ahead of time will make the trip less stressful. I use a non-conventional barbecue grill cleaning method — I remove ashes and wipe down the grate with a dry, cotton rag after I use the grill, but I don’t thoroughly clean the black coating off the grate. I wait to clean off the black coating until I heat up the grill the next time I use it to keep the grate from rusting in between uses. When I do clean the black coating off the grate, I let the grate heat up over the fire for 10 minutes and then scrub it deeply with a metal grill brush. The heated black crud comes off without much elbow grease, and cleaning gives me something to do while the flames are dying down and the coals are heating up. A friend recently suggested to me to ditch the metal grill brush and to wipe the grate down with half an onion instead. He explained that there is something in onions that eats away at the black gunk (he’d read an article once on Lifehacker about it). I have yet to try this method because I’d rather eat grilled onions than use them as cleaning products, but based on his experience it seems to be a legitimate way to clean the grill grate if you don’t mind the smell and taste of onions. 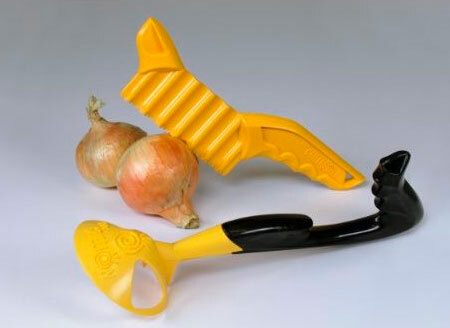 The thing that resembles a small hatchet is to cut your onion in half (apparently, a knife you already own isn’t good enough to cut your grill-cleaning onions) and the plunger-Starship-Enterprise looking thing is the specialty plastic tool that holds the onion while you clean the grill grate. 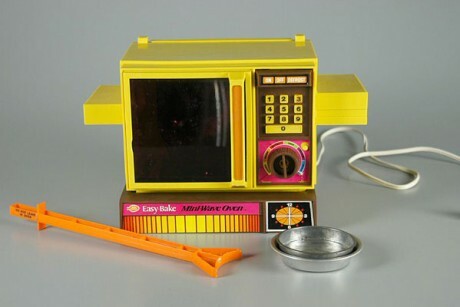 Upon seeing the device, my immediate thought was that the inventors of this device never had an Easy Bake Oven as a child. This is clear because every child who had one of these toys quickly learned that heat and plastic do not mix. If something as tame as an incandescent light bulb can melt a plastic orange stick in a matter of seconds, just imagine what a roaring fire will do when it comes into contact with that plastic claw holding the onion. I’m going to stick to using my metal grill brush and my friend is going to just use his onion on a barbecue fork when cleaning the grill. I’ll use the extra $20 to buy a nice Porterhouse, which I’ll probably drench with a balsamic vinegar steak sauce. Yum. Thanks to reader Verily for bringing this unitasker to our attention. There are many options for opening a bottle of wine, but none of them will make your gadget loving friends as envious as this Peugeot Rechargeable electric wine opener from Williams-Sonoma. I’m not a huge gardener, but I do have a handful of tools that I use to keep my yard in order. Janine Adams, owner of Peace of Mind Organizing in St. Louis, in her guest post today shares her seasoned, practical advice for keeping hobby supplies from taking over your home. Welcome, Janine! If your craft area becomes overwhelmingly cluttered, it can do a number on your creative spirit. It doesn’t have to be that way, though. You can try this approach to gain control of your craft space–and create space to craft. Sort everything: Once you’ve decided on your categories, start sorting your supplies into those categories. You may end up modifying your categories a little, and that’s okay. If you run into unfinished projects, you can create a category for those, too. But do give some thought as to whether you’ll actually ever finish them. Why did you run out of steam on a certain project in the first place? If you don’t realistically think you’ll ever finish a project, perhaps you can deconstruct it and sort the components into their appropriate categories? Weed mercilessly: You’ll have more space to craft if you have fewer supplies to store. Are there some supplies lurking there that no longer appeal to you? Perhaps your tastes have changed? Heck, there may be whole categories of crafts that you no longer do. Consider letting them go so they can be used by others. Decide on containers: It’s so tempting to buy containers right away, but if you do it before the sorting and weeding process, you might end up with less-than-optimal storage solutions. Don’t limit your search to organizing and craft stores. You might find storage ideas at a sporting-goods store (I store my circular knitting needles in a tackle binder used for fishing, for instance), an office-supply store or a housewares store. IKEA is full of possibilities. Pinterest can be a great place to find innovative storage solutions. Also, check out the Creative Organizing blog of my friend and fellow professional organizer, Aby Garvey, co-author of the fabulous book The Organized and Inspired Scrapbooker. Shop at home: Now that you have an organized craft space, you can save money and effort by using what you have, rather than going to the craft store. All that thought you gave to your categories can really come in handy when you shop your stash!